Perfect for couples or small families. Welcome! My family invites you to vacation within the outstanding gated thirty three acre oceanfront Myrtle Beach Resort. Including a half million dollar huge lazy river project, well tended grounds, multiple pools, whirlpools, tennis, play areas, and a wide variety of amenities, we are sure you will find everything you are wanting and more, for your memorable vacation at the beach! Call us at (231) 845-8074 to reserve your dates for your inviting and secluded one bedroom second floor courtyard condo with balcony. Our reasonable winter rates are just $699 per month, plus 13% taxes. This includes departure housekeeping, linens, a supply of towels, a gate guest pass, and use of all resort amenities. Besides the largest oceanfront pool in Myrtle Beach, the Myrtle Beach Resort features the second largest lazy river ride in the area, an assortment of other pools, and all the amenities you desire, along with the Quarterdeck - a year round oceanfront bar and grill with plenty of live music and activities. The lazy river is open seasonally, and is also heated for everyone's enjoyment. We know that when we go on vacation, we don't want to have to lug a bunch of linens, blankets, comforters, and bath towels along. Who has room for these anyway? 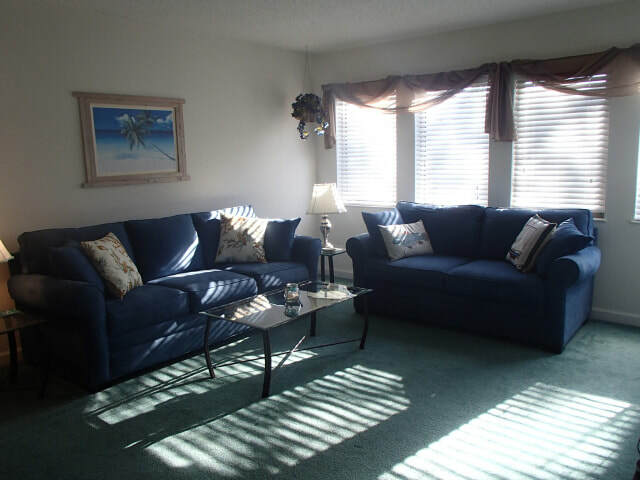 Our special guests will enjoy a clean, comfortable, newly updated, and well equipped Myrtle Beach vacation condo. Towels, linens, pillows, a well equipped kitchen, DVD, two cable flat screen televisions with HBO and approximately 100 channels, departure housekeeping, discount coupons for area restaurants and attractions, plus a resort gate guest pass are included for the vacation condo. The only additional fee is South Carolina lodging taxes. Besides the amenities that we offer guests, just a few of the other amenities offered by the thirty three acre Myrtle Beach Resort include the use of six pools (one is indoors, and one is an indoor/outdoor pool) including the largest oceanfront pool in the Myrtle Beach area, five whirlpools, multiple lighted tennis courts, basketball, bocce ball, sand volleyball, shuffleboard, putting green, saunas, two arcade game rooms, two exercise rooms, play areas, picnic areas, sun decks, reading & puzzle room, and over 750 feet of prime Atlantic Ocean beachfront. The resort is conveniently located in the family friendly area of Myrtle Beach, and is gated and secure, with twenty four hour roaming security for peace of mind. From the ocean with its sand dunes and sea oats, to the beautifully landscaped grounds, complete with lagoons, duck ponds, picnic areas, palm trees, and old fashioned wooden swings, you will be completely enchanted by the tropical surroundings of your Myrtle Beach vacation accommodations. We enjoy strolling down to the ocean front Quarterdeck year round for appetizers, casual dinners and beverages. Live music, karaoke, and trivia nights are all popular. During the winter the Quarterdeck is heated, and Mylar screens do not block the stunning ocean views. Of course, your Myrtle Beach Resort Five Seasons Centre condo allows you to do all of the cooking you want, or just take advantage of having a full size refrigerator and all your other favorite appliances. For information, availability, & reservations for this well cared for Myrtle Beach Resort condominium, please contact your owner Melanie directly at (231) 845-8074, or email melanie@candleliteinnludington.com.